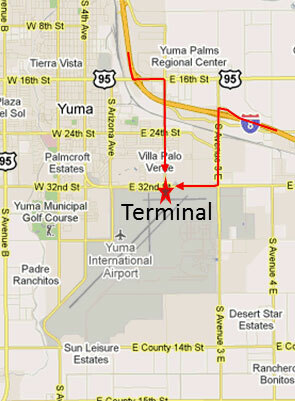 Take Exit 2 onto Highway 95 (16th St) going east, turn right on Pacific Ave. Cross 32nd Street to enter the Airport Parking Lot. Take Exit 3, turn south (left) onto Ave 3E. Turn right on 32nd Street. 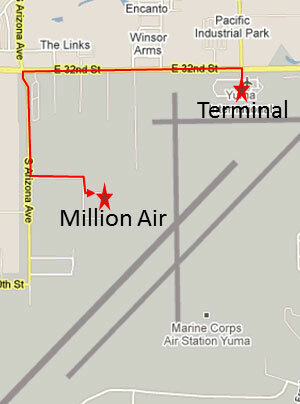 One mile, at Pacific Ave, turn left into the Airport Parking Lot. Inside the Terminal you'll find everything you need within a few quick steps. From the parking lot, turn left on 32nd Street. At the first stop light, turn left on Arizona. At Gillaspie Place, turn left, then right on Burch Way. Next left into the Million Air Parking Lot.